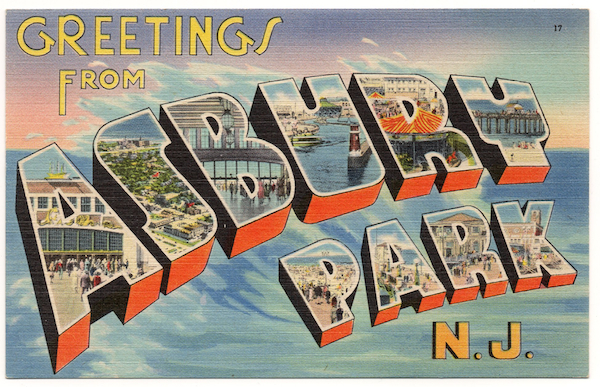 In 1973, New Jersey's favorite son, Bruce Springsteen, used a linen Tichnor postcard (although with a more generic, and boring, background) for the cover of his first album, making it the most recognized large-letter postcard out there. 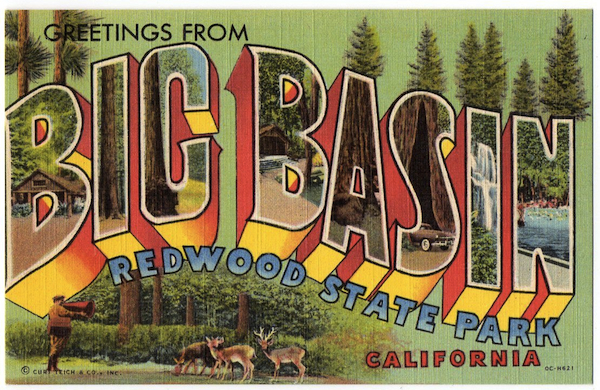 State parks such as Big Basin in California were popular subjects since the cards could be sold in park gift shops. This Curt Teich is from 1950. Some people like to collect postcards made for military bases around the country. 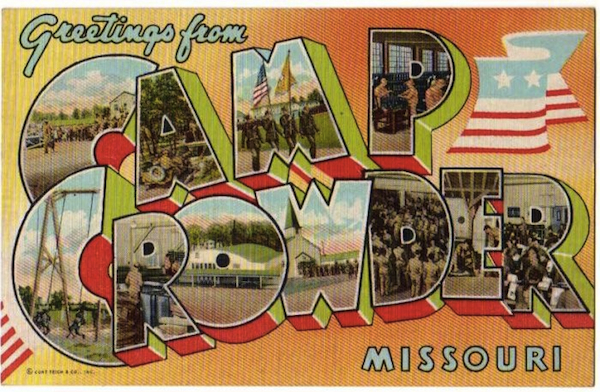 This 1942 Curt Teich card celebrates Camp Crowder in Missouri, which had opened the previous year. 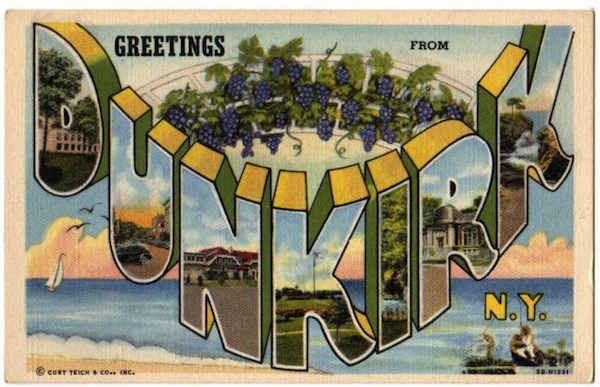 In 1945, Dunkirk, New York, on the shores of Lake Erie, must have been known for its grapes, or so this large-letter Curt Teich postcard would suggest. 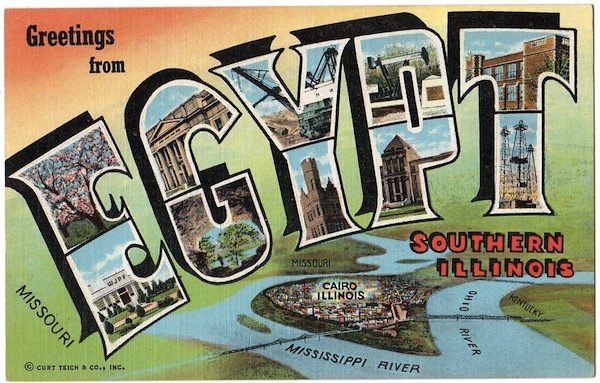 Southern Illinois, where the Mississippi and Ohio rivers meet, is known as Egypt or Little Egypt. Some cards, such as this Curt Teich from 1945, included maps as well as scenic shots in their design. A fan of radiating bands of color was a popular background treatment on many large-letter postcards. 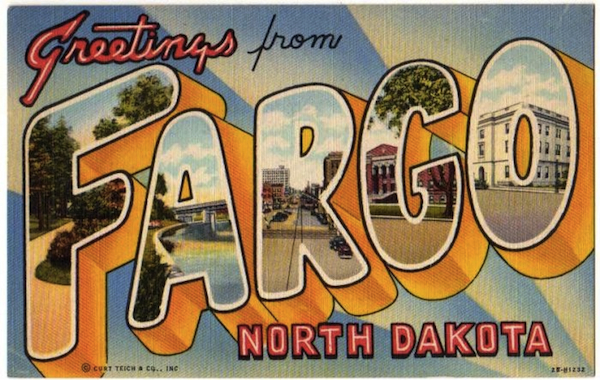 This Fargo card was printed by Curt Teich in 1942. 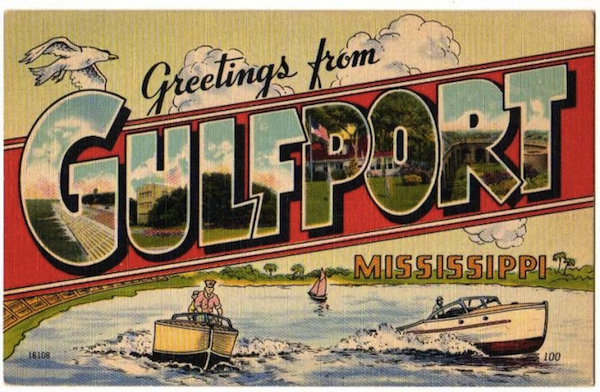 There's no question what Gulfport, Mississippi, has to offer visitors, as this colorful Colourpicture postcard shows. 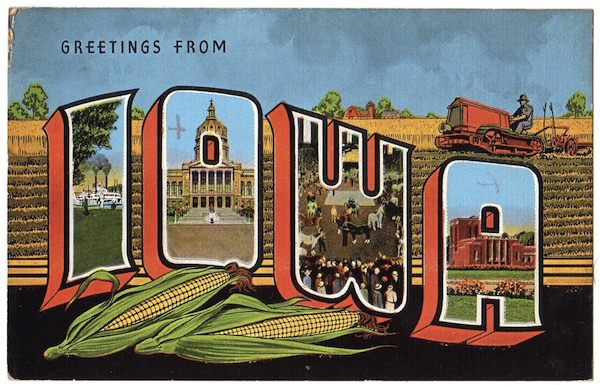 Quick: Name a vegetable that's grown in Iowa. E.C. Kropp of Milwaukee printed this beauty. 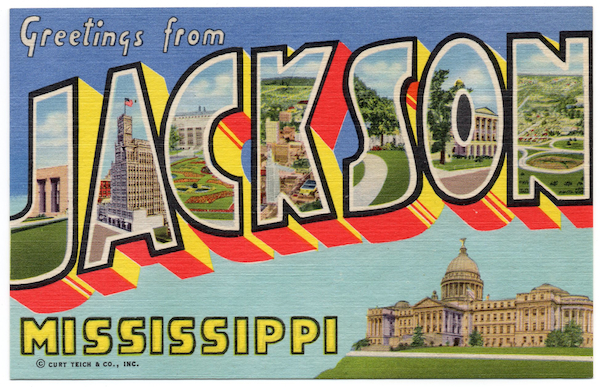 This Jackson, Mississippi, card is particularly rare, which means it can sell for more than $250. Curt Teich printed it in 1938. 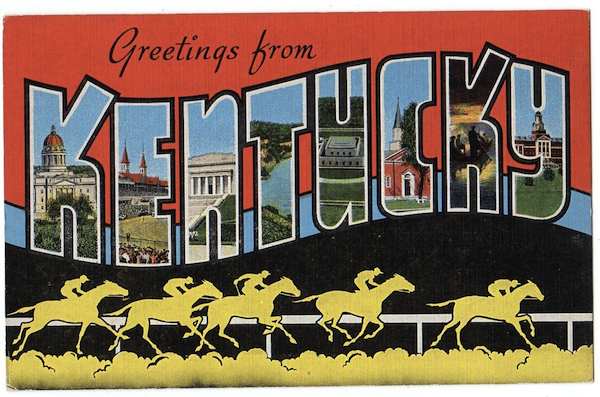 There are several versions of this Kentucky card by E.C. Kropp. This one with a red top section and yellow horses is less rare than the one with the yellow top and blue horses. 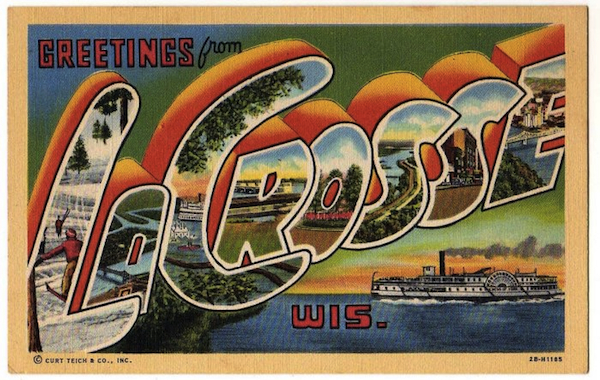 A beautiful card with simply gorgeous letters celebrating La Crosse, Wisconsin. Printed by Curt Teich in 1942. 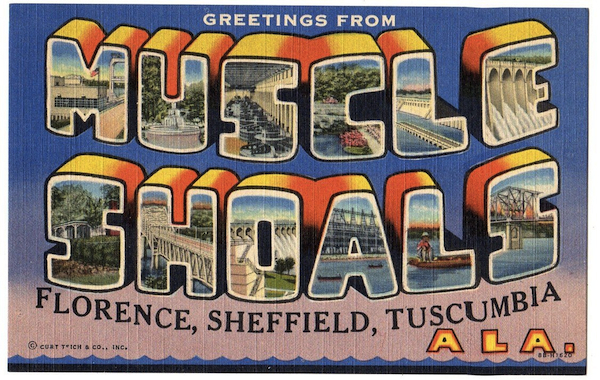 Before it had a reputation as a little town with a world-class music studio, Muscle Shoals was known for its hydroelectric facilities. This card was printed by Curt Teich in 1948. 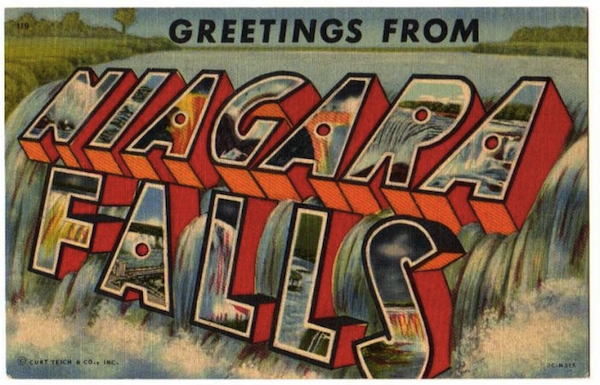 Here the letters for Niagara Falls appear about to tumble to their doom. Curt Teich printed it in 1950. This is the only known copy of a large-letter postcard from Oriente, Cuba. Kevin Hilbert acquired it a few years after publishing his and Fred Tenney's book. 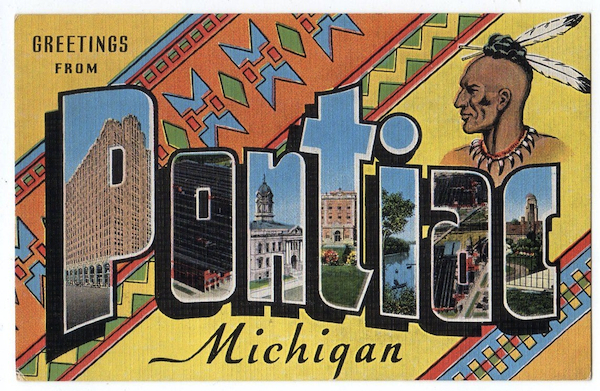 The city of Pontiac, Michigan, takes its name from the Native American tribe that lived there before the arrival of Europeans. Printed by E.C. Kropp. 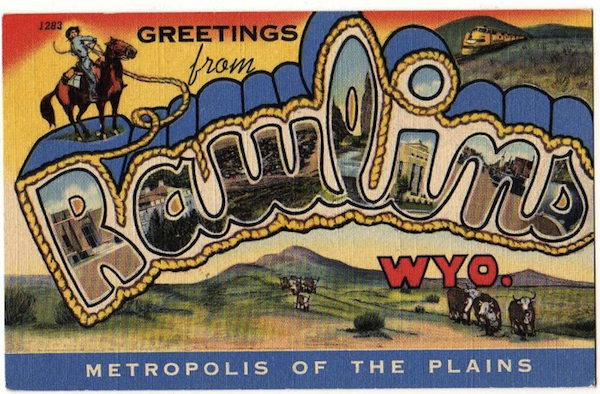 It's not clear that Rawlins was a "metropolis" when Curt Teich printed this card in 1948, but the rope border on the lettering is very nice touch. 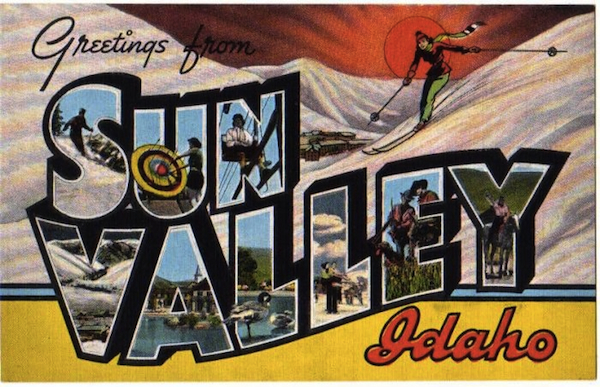 Early on, Sun Valley was promoted as a ski destination, as this E.C. Kropp card makes clear. The bigger the letters, the more graphic the depictions could be inside and out. This Curt Teich card is from 1937. Large-letter postcards of Route 66 are popular among collectors, who will sometimes acquire cards from every city along the Mother Road. This Curt Teich is from 1945. 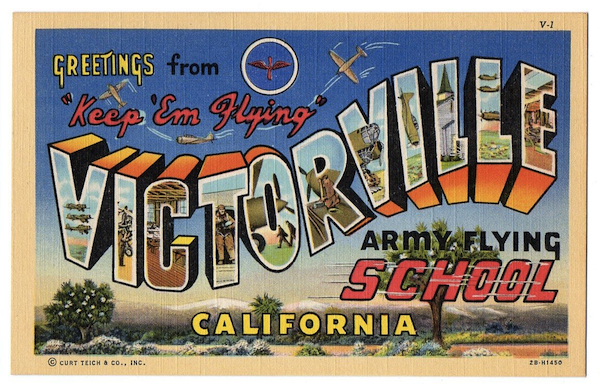 Military-base cards such as this one from Victorville, California, are favorites of collectors. Like the Camp Crowder card, Curt Teich printed this one in 1942. 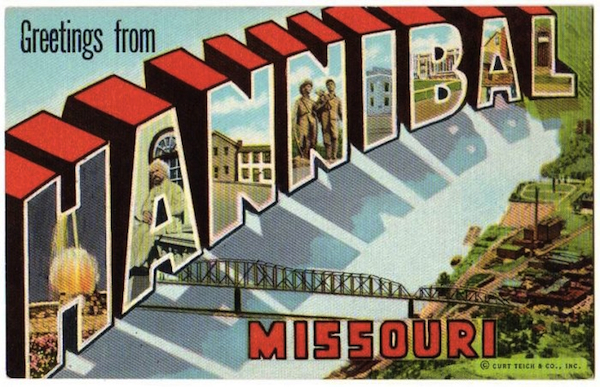 Black backgrounds were an easy motif for early large-letter-postcard designers. This one of the nation's capital was printed by Curt Teich in 1934. 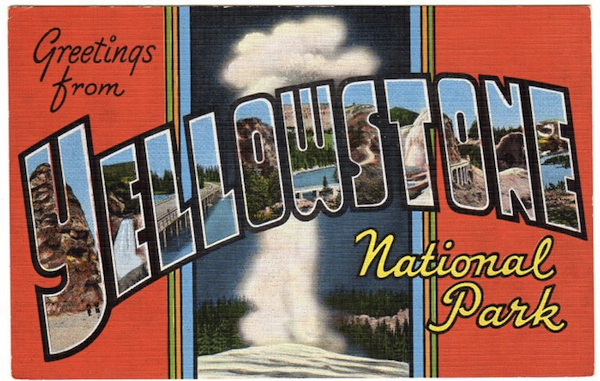 Like state parks, national parks were popular subjects because they came with a built-in distribution system (i.e., gift shops). This one was printed by E.C. Kropp. Not many cards depict places beginning with the letter Z, but this 1955 Curt Teich Zanesville card is not especially rare. From the 1930s through the 1950s, tourists taking their first road trips in their newfangled automobiles would frequently stop along the way to pick up a few colorful postcards to mail to the folks back home. The most popular form of eat-your-heart-out greeting was the large-letter postcard, which had been around since the first part of the 20th century but whose heyday was during what we know today as the linen-postcard era. Made of textured paper rather than actual cloth, linen postcards were printed by companies such as Curt Teich & Company of Chicago, Tichnor Brothers and Colourpicture of Boston, E.C. Kropp of Milwaukee, Beals Litho & Printing of Des Moines, and Dexter Press of Pearl River, New York, among many others. 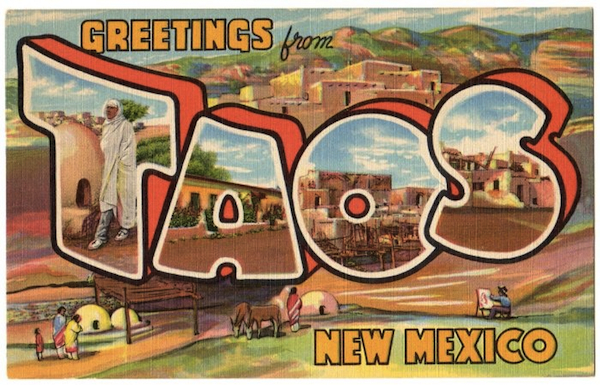 Their souvenir postcards for states, cities, military bases, and tourist attractions were usually heralded at the top by the words “Greetings From,” below which were large, blocky, dimensional letters filled in with illustrations or photographs of the destination’s most scenic or noteworthy sights. 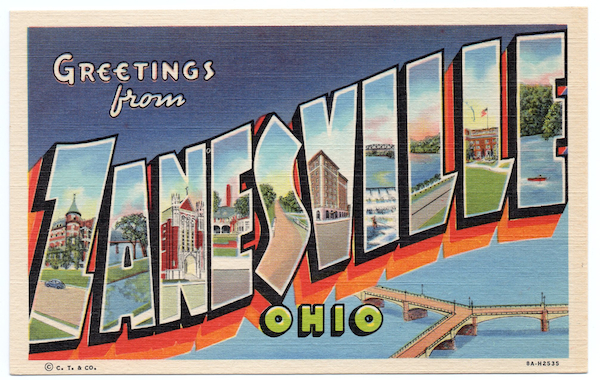 Since 2009, the primary resource for fans of this popular postcard genre has been “Large Letter Postcards: The Definitive Guide, 1930s to 1950s,” written by Fred Tenney and Kevin Hilbert. 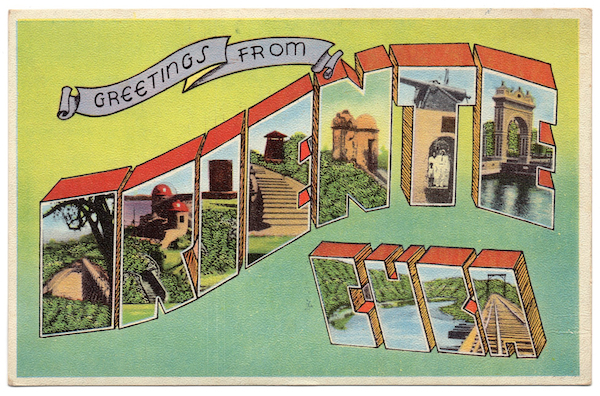 Published by Schiffer, “Large Letter Postcards” features more than 2,200 examples, from several dozen versions of Atlantic City cards (Curt Teich’s first linen large-letter) to cards for Coney Island, Niagara Falls, and Death Valley. 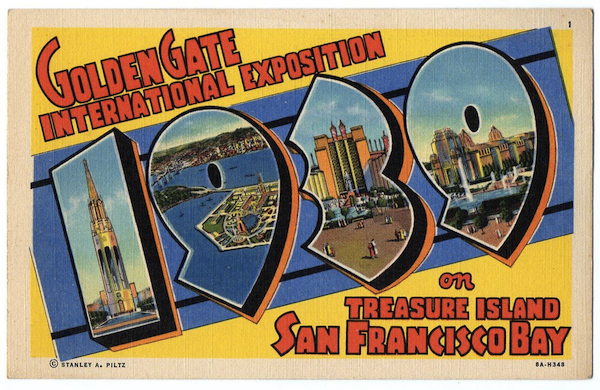 Also included are several examples of how large-letter postcards were created, from the card’s initial sketch to its final design, courtesy of materials loaned to the authors by the Curt Teich Postcard Archives. 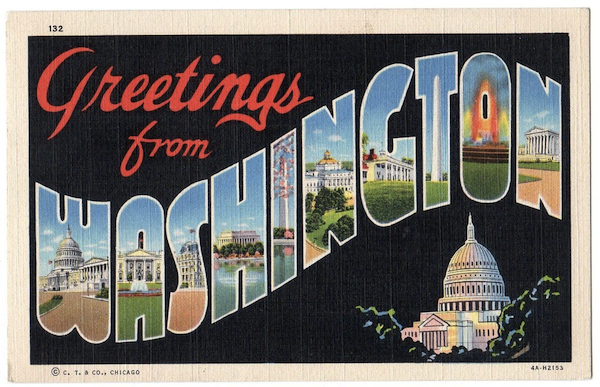 Though published by Stanley A. Piltz of San Francisco, the stock number of this large-letter postcard (seen at lower right) identifies it as a Curt Teich card, printed in 1938. While Tenney freely admits that he got into large-letters because he noticed there were a lot of them available for a dime when he was sure he could sell them for a buck, Hilbert is a serious collector, owning, by his estimation, some 6,000 to 7,000 postcards of various types, including the duplicates. “When I first started out,” Hilbert says, “I wanted to get all the Arizona ones.” That’s how most collectors begin, accumulating cards from their hometown or state (Hilbert lives in Tempe, Arizona). 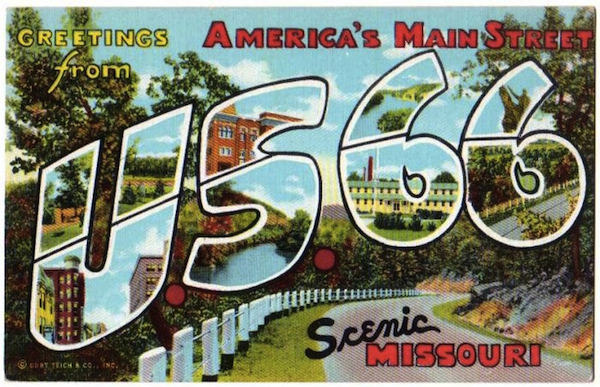 “Then I wanted to get one from each state,” he continues, “then I decided I wanted to get all the Curt Teich large-letters.” That put him on a course to collect the more than 1,000 linen large-letter postcards printed by Curt Teich. Hilbert eventually branched out to Tichnors and cards by other printers, as well as more arcane classes of large-letter postcards, from “folders” (an accordion-folded sheet, whose images on the postcards that make up each sheet can often be matched to the views within each of the large letters on a sheet’s cover) to minis (postcards that are only about 2 1/2 inches tall by 3 1/2 inches wide). 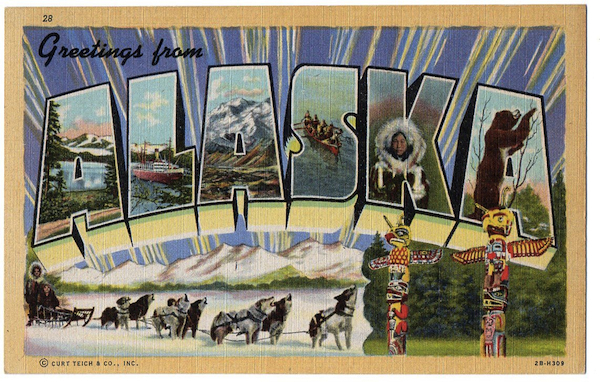 Curt Teich printed exactly one card for the state of Alaska. According to postcard lore, the 1942 cards were not good sellers, and so the retailer who ended up with boxes of them eventually threw them in a dumpster, creating instant scarcity. Curt Teich is in a class all its own, employing three distinct printing techniques—the five-color Colortones, which account for 90 percent of all Curt Teich large-letter postcards; four-color American Art cards printed from 1940 to 1955; and the five-color Photo-Colorit process, which was used on only five deckled-edge postcards printed between 1938 and 1948. To date a Teich postcard, look for the number and letter preceding the card’s stock number on the lower-front of the card or running vertically in the center of its back. An “A” identifies cards printed in the 1930s, “B” is for the 1940s, and “C” denotes the 1950s, which means that a cards beginning with “8A” was printed in 1938, “5B” in 1945, “0C” in 1950, and so on. Great article! I think the unique, canvas-like texture adds to the appeal as well. It was developed specifically to accommodate the new inks that came available at that time. And fortunately that time coincided with the building of Boulder/Hoover dam, which are the ones I collect!